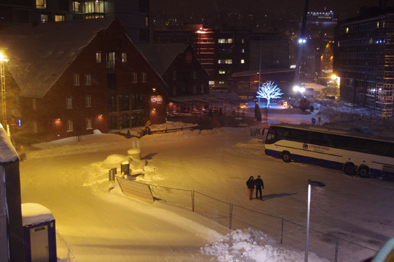 My companion and I arrived in Tromso by plane from Gatwick Airport at 3.20 pm local time (2.20 London time) to find that snow had fallen and so had night. 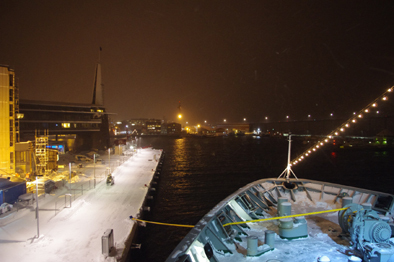 A short bus ride took us to the harbour where our cruise ship, the Nordlys (Norwegian for Northern Lights) awaited us. I dined at 6.30 on cauliflower soup, some sort of smoked fish followed by a sweet which seemed to consist of cold rice pudding, jam and blue berries. 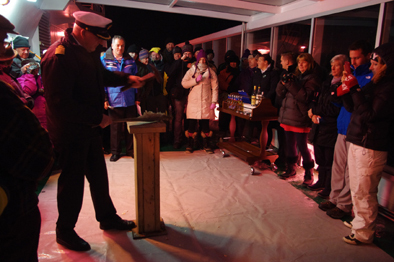 Later at 9.30 I accompanied some stoic passengers out to the “sun” deck where we watched the captain demonstrate how to prepare “Stock Fish”, which is dried cod tenderised with a hammer and is a Norwegian delicacy. Unfortunately I was offered a piece which was not tenderised enough and broke a back molar. The Captain of the Nordlys Preparing Stock Fish. I am now sailing north along the Norwegian coast deep into the Arctic Circle wondering what further fortunes lie in wait.